You are currently browsing the tag archive for the ‘pre-K’ tag. Georgia’s Pre-K: Governor Deal released his recommendations the funding and implementation of Georgia’s Pre-K. The plan commits to using one third of Lottery education revenues for Pre-K, includes the addition of 5000 Pre-K slots, but cut the Pre-K day from 6.5 hours to 4 hours. Some funds have been added to augment extended stay programs for low income children as well as transportation, but questions remain as to the effects such a significant cut in funding. Click here to read the Governor’s press release about his Pre-K and HOPE plan. 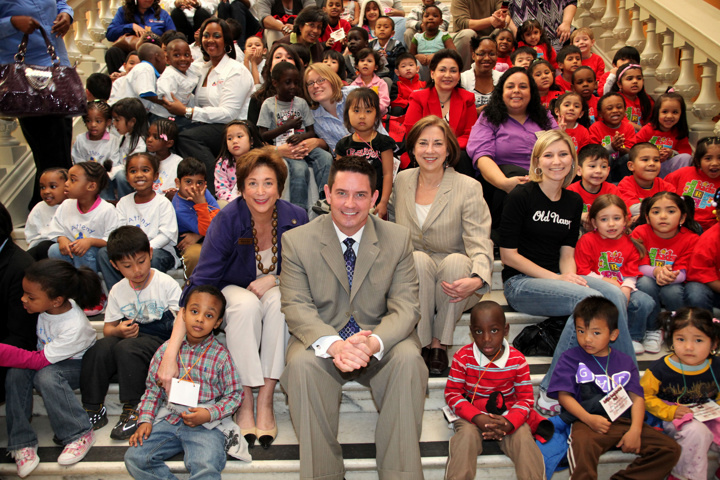 GA Pre-K Week: Both HR 362 (Rep. Brooks Coleman, 97th Dist.) and SR 183 (Sen. Fran Millar, 40th Dist.) were read and adopted, declaring the first week of October as Georgia Pre-K Week in recognition of the educational, societal and economic importance of preparing young children for kindergarten through pre-k programs. In 2009, Georgia was awarded an $8.9 million federal grant to improve its educational data system. Since then, Georgia Department of Education has been developing a statewide Longitudinal Data System (LDS), which allows the State, school districts, schools, teachers and ultimately, parents to make data-driven decisions to improve student learning. In fact, a large piece of the Federal Race to the Top Grant Georgia received last year is tied to the implementation of such a system. Enrollment, attendance, assessment, and course information for Georgia’s public school students has been gathered for ages, and now can be easily and quickly reviewed. The application is designed to players at every level to make data- driven decisions to improve student learning, and allow assessment and planning which could help close achievement gaps. Already, the system has been implemented across most of Georgia, and though districts can choose whether or not to participate in the program, so far all but one county has chosen to opt in. Monday, I was fortunate enough to attend demo on the DOE’s K-12 LDS, which some day (hopefully soon) will also track students through preschool and post secondary school as well. Though the system still needs a few more bells and whistles, the sheer ability to drill down into long term data about each district, school, teacher and student is pretty impressive, and useful. I am even more pleased, however, that the system promotes education as a continuum. Long has Georgia needed to align the designs and demands of Pre-K, K-12, college and technical schools so that investments made in all parts of the journey come to fruition for each child. The move for K-12 Common Core Academic Standards has largely been embraced with governors from 48 states signing on to the effort. Now comes word of plans to work on standards for very young children. A new article available on the EducationWeek website [Both Value & Harm Seen in K-3 Common Standards] addresses some of the potential good and potential pitfalls around standards for K-3 education and provides the above quote referencing the latest move to expand the standards even further to include the youngest children. We know that ensuring all children are school-ready is important. Research is clear that our most vulnerable children start school already far behind their peers with limited vocabularies and limited social skills. Those children rarely catch-up. Will “standards” help? What are your thoughts? How far can lottery dollars stretch? The State Senate’s Higher Education Committee passed Senate Bill 496 establishing a needs based HOPE grant today. Currently, the HOPE scholarship is based on merit, not need. And, although there are currently over 8000 children on a waiting list for Georgia Pre-K, the program is supposed to be available to any family to wishes to enroll their 4 year-old. SB 496 would establish a new program which would award small grants for college to families based on need as long as state lottery funds are available. Providing needs-based grants for college has merit. Yet, it concerns me that legislators are moving closer towards approving a new use of lottery funds at a time when costs of HOPE and pre-K already exceed lottery revenues, the demand for pre-K slots exceeds availability, and the Governor has proposed cutting the Resource Coordinator Program which provides essential services that ensure school success to at-risk pre-K families. Pre-K families in Georgia should not get whatever pennies are left in the lottery after HOPE and the new needs-based grant are funded. Instead it is time for a re-examination of the goals, funding formulas and priorities of all programs funded by the Georgia Lottery.